With Courts of the Shadow Fey just released, the timing couldn’t be better for the debut of a special edition Warlock booklet, Guide to the Shadow Realms. The guide was a threshold goal on the Warlock Patreon. If you’re not familiar, Kobold Press is producing Warlock (24–28 pages for 5th Edition in PDF and print), full of world-expanding goodness and awesome mechanics for your game, and Warlock Lairs, short adventures playable in a session or two. You can be involved for as little as a dollar a month, and really, given what’s included, there’s no reason not to be. $3 gets you digital versions of both Warlock and Warlock Lairs. 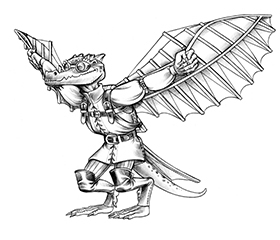 But for the $5 and up patrons, in addition to the print versions, Kobold Press produces additional supplements as a thank you for hitting certain numbers of supporters. They’ve already crossed two threshold goals. 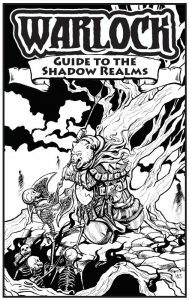 The first of these was a Warlock Bestiary, and now, we have the Guide to the Shadow Realms. And never fear, even if you aren’t a Warlock patron, you can still purchase them in the Kobold store. The Guide to the Shadow Realms is exactly what it sounds like. From designer Kelly Pawlik, it features seven secrets of the Shadow Realm, describing the mysterious structure known as the Ring and its mysterious and very powerful Ringmaster, and gives us an overview of an encounter table for the Tenebrous Plain. The guide has tips on Shadow Realm etiquette, a table for adjusting Status in the Shadow Realm (losing a consort’s affection will cost you a point!). It includes new spells created by shadow fey and other denizens of the Shadow Realm—my favorite is the 1st-level conjuration spell pratfall. It’s pretty much exactly what it sounds like, and I can’t wait to have one of my player’s spellcasters discover it. But if you want something less comedic, the 8th-level transmutation spell child of light and darkness is really something to behold. There are also two new creatures of Shadow: the shadowspider swarm and orphans of the black. Imagine the susawatari, the dust mites of My Neighbor Totoro and Spirited Away, only totally evil and hungry and wanting to devour the warmth of living creatures, and you have the shadowspider swarm. As to the orphans of the black, well, go watch Children of the Corn again. Weird, evil children always freak me out. But both are wonderfully creepy and will certainly enhance the macabre tone of a visit to the realm. But the heart of this for me, the thing I’m personally most excited about in this guide, is the middle section all about Corremel, the City of Lanterns, Corremel-in-Shadow. This is a full on, 12-page gazetteer for the Shadow Realm’s mirror city of the Southlands city of Corremel. Corremel is a huge crossroads of the planes, a city with a population of 50,000 individuals, where both coin and memories can be traded for your needs and desires. And the guide to such a place doesn’t disappoint. There’s a beautiful 2-page map by cartographer Alex Moore, details on sixteen locations through the city, population statistics, NPCs, markets where magic items and exotic ingredients can be found (with actual rules for hunting them up! ), a sidebar on the Laws of Corremel, and some great information on the rivalries and tensions in the city. Oh, and watch out for the Tumbles. The fabric of reality has grown so thin in this slum district that bits of architecture may slide in and out of other worlds. While wandering through its dilapidated tenements, there’s a chance that players may unwittingly stumble out of the Shadow Realm altogether. When a misstep can land you in the Eleven Hells or Klingedesh, you’ve got to be careful where you place your feet! I don’t know what’s worse, accidentally falling out of Corremel altogether or offending Hander Svenk, the Black Prince and ending up a prisoner in one of his palace’s six towers. Trust me. Go pick up the Guide to the Shadow Realms now, and then sign up for the Warlock Patreon. I’ve just noticed that their next threshold goal is for a Warlock Guide to the Planes and they are less than 60 patrons away! I need that for when my players invariably blunder through a portal in the Tumbles. Otherwise, I don’t know where they’re going to end up! And neither do you! Lou Anders is the author of Frostborn, Nightborn, and Skyborn, the three books of the Thrones & Bones series of middle grade fantasy adventures, as well as the novel Star Wars: Pirate’s Price. You can find out more about him and his works at www.louanders.com, and visit him on Facebook and on Twitter @LouAnders.